Last Friday the MPAA and RIAA filed a joint submission with Intellectual Property Enforcement Coordinator Victoria Espinel. The two groups gave their recommendations for future IP enforcement policy and among other suggestions offered to help out with future international actions against “rogue sites” such as Megaupload. “In this case, the Justice Department and other federal agencies are now grappling with a set of wealthy and arrogant defendants who are leaving no stone unturned in their efforts to sway public opinion against efforts to hold them accountable,” the groups wrote. Ignoring whether or not the statements apply to Dotcom or not, being “wealthy and arrogant” is by no means a crime. In fact, many people in Hollywood and the music business can easily be described using the same terms. In addition, “swaying public opinion” is one of the main goals of both the MPAA and RIAA. 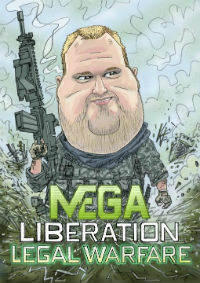 “They are calling me names because the case against Megaupload is a stillborn cripple,” Dotcom told TorrentFreak. Dotcom is referring to the so-called “revolving door” between the U.S. Government and the copyright industries. As a result, the MPAA and the U.S. authorities prosecuting Megaupload can be considered a close group of friends. “A recent example is the senior vice president of the MPAA Marc Miller who recently called me a ‘career criminal’ at a press briefing regarding the potential dismissal of the Megaupload case,” Dotcom says. “Good friends help each other,” Dotcom adds. One of the most crucial employees at the MPAA is its CEO Chris Dodd, who joined the movie industry group in 2011 after serving as a senator for thirty years. “The MPAA made the ultimate hire with former Senator and Joe Biden’s best friend Chris Dodd. They now own the ear drums at the White House. And Chris Dodd is using his influence,” Dotcom says. “The US Attorney [Neil MacBride] leading this case was a former copyright lobbyist and lawyer of Joe Biden. He is also a buddy of Chris Dodd. This gang of friends plotted the takedown of Megaupload in bad faith,” Dotcom adds. As mentioned before, Kim Dotcom and his legal team claim to have evidence that vice president Joe Biden was the one who ordered the shutdown of Megaupload. According to Dotcom the vice president admitted this in public. Dotcom is convinced that Biden is the mastermind, and that people such as assistant U.S. attorney Jay Prabhu are nothing more than foot soldiers waiting in line to walk through the revolving door. While the entertainment industry and the U.S. Government succeeded in taking Megaupload out, at least temporarily, Dotcom believes that the truth will come out in the end. “The evidence of corruption is surfacing thanks to whistleblowers. This time they went too far and it’s going to bite them where it hurts,” Dotcom says. Megaupload’s founder already scored a victory in New Zealand, and he believes that more will follow. “Independent New Zealand judges see right through the politically motivated maliciousness of this case and won’t become an accessory after the fact for big content billionaires in the US,” he says. According to Dotcom the public has an important role to play in turning this case in favor of Megaupload. Voting Obama out of office is a good start, as he is in the pockets of the MPAA and RIAA. “Remember the Mr President song? ‘Don’t let them get away with that’. You can start by voting for a new administration in November if Obama isn’t turning this around. Hollywood and the MPAA are only backing Obama’s re-election and can’t expect any favors from Mitt Romney. Romney is simply the better bet for a free Internet. “You have the power to send a strong message to the next President of the United States. Get involved. Tell your friends. Blog and tweet. Take your Internet back while you still can,” Dotcom concludes. c There are 193 comments. Add yours?